Subway is a company that gives back, doing great things for customers and charities, as well as selling delicious sandwiches, salads and sweet-treats (have you tried the cookies?) The latest promotion that Subway is offering is a generous one; a free sub for every customer who purchases a large drink or 500ml bottle of water. The promotion is happening nationwide tomorrow, Tuesday 14th February, in participating stores. Purchasing a drink redeems you a free, six inch sub of your choosing. 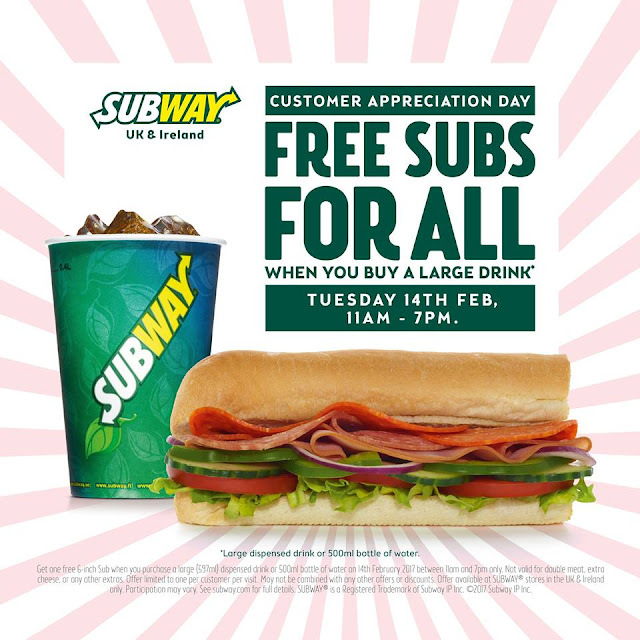 Subway has held this or similar promotions in the past, both in the UK and across the US. Charity work is also important to the company, holding events and incentives. On November 3rd of last year, a similar offer was held in US Subway branches. This was to celebrate National Sandwich Day, (who knew that was a thing; totally on-board) in which each free meal or sub given to a customer also provided a meal to the Feeding America food banks. Plus, in the UK last year, the brand hosted their ‘Subway Helping Hearts Family 5k Fun Run’ series all over the country, launched in 2013. The popularity and participation has risen year after year, with 10,603 total family participants last year, supported by social media and news attention. The programme raises money for Heart Research UK, and during the event, health and fitness is encouraged in families, as well as Subways vouchers being distributed. So, what to go for tomorrow on Customer Appreciation Day? How about a classic chicken salad-type in the form of the Chicken Breast sub? Or are you more adventurous, going for the saucy, messy-to-eat but delicious Meatball Marinara? Of course there are options for veggies too, with the Veggie Patty sub, or, as usual, there’s the option to pick and choose your fillings and sauces as you wish. However, if you’re an extra-cheese-lover or go for the double meat option in your sub, this unfortunately isn’t included in the promotion. There was always going to some restrictions, but they’re offering free subs, so we can’t really complain. Whatever your sandwich preference, the offer is available between 11am and 7pm. Check out the Subway website for participating stores and further terms and conditions.